Trout love cold water and that makes Fall a great time for fly fishing in Smoky Mountain streams like Deep Creek (above). To fish in the Great Smoky Mountains National Park, you must have either a valid North Carolina or Tennessee fishing license. No license is required to fish in Cherokee Reservation waters, however a tribal permit is required. The cost is $7 per day with a creel limit of ten. You can purchase a basic North Carolina license for a period of one day, three days or one year. The one-day cost for a resident is $5 (one year is $15); for a non-resident is $10, two days $15, one year $30. If you plan to fish for trout outside the National Park, an additional “trout stamp” is required at a cost of $10. 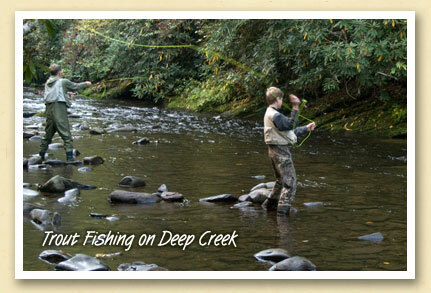 Some of the trout streams are strictly catch-and-release. For more information about North Carolina fishing, go to Online Fishing Regulations.